In 1853, a Swiss chemist by the name of J. C. Galissard de Marignac, spectroscopically discovered samarium in the material dydimia. Very similar to praseodymium, samarium is one of the rare elements used to make carbon arc lights for use in the motion picture industry. Comprising about 1% of Misch metal, the element is also used to make flints for lighters. 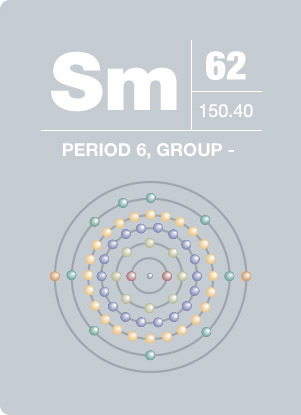 When combined with cobalt, the elements produce a powerful permanent magnet with a high resistance to demagnetization. Samarium oxide is also added to glass to sensitize the phosphors in infrared radiation and acts as a catalyst for the dehydration and dehydrogenation of ethanol. While samarium has no known biological role, it is purported to stimulate metabolism.